Primer! Got the gondola spray-primed grey and the balloon envelope brush-primed black. All primed up, except the base. Click for larger. 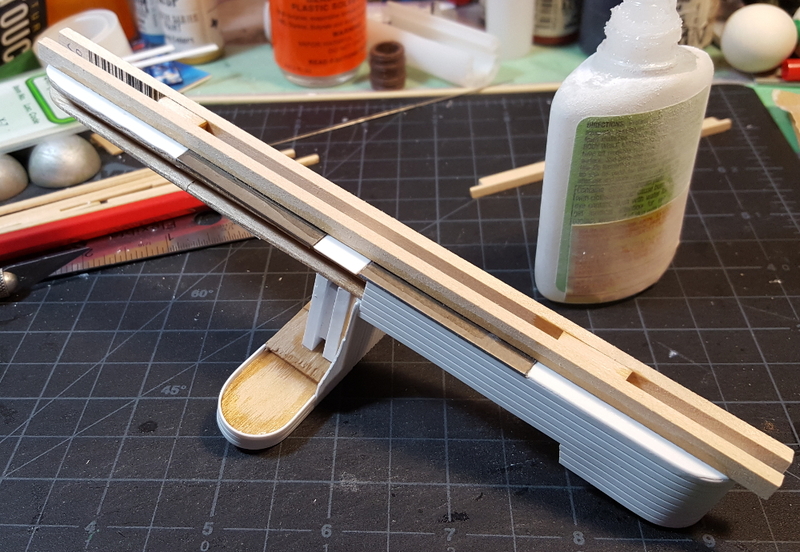 The LAF Build Something 2017 contest rules ask that you not post painting progress photos of your project past the priming stage, so this will be the last photo anyone sees of the Blomp itself for a while. I’ll try and remember to take some in-progress shots and save them for a post-contest photo gallery, though. Up next is finishing the base with a bit more putty and then paint and flocking, and then working on the half dozen or so goblins who are going to be crewing this thing! Deadline is Feb 18th, which is coming up awfully fast! Greenstuff all over the place this time! Base greenstuff work – on the troll, the barrel, and the base itself. More to come! Click for larger. 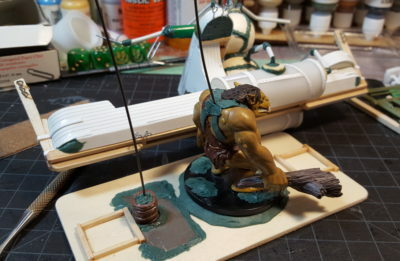 I’ve started on the heavy leather harness that the troll uses to tow the Blomp along, as well as structural greenstuff to secure and cover the magnets in his base, hold the barrel in the right position, and secure the steel plate the barrel magnetizes to. There’s at least one more round of greenstuff here, the front and belt parts of the troll’s harness don’t exist yet, and the base needs some more patching up. Greenstuff on the piping around the Engine. Click for larger. Up on the gondola the various joints in the pipes have greenstuff seals added. I’ll be painting them up as leather, which has historically been used as a seal and still is to this day in some applications. I also smoothed out a few parts of the hull, and on the first photo above you can see the putty filling in the underside of the bridge wings to secure the three eye-bolts on each end. The eye-bolts are jewelry making supplies, intended to be posts on earrings or something. I have a little baggie of dozens of them, and I think they’ll come in handy for all sorts of things – parts of railings, for example. It pays to cruise slowly down the random aisles of your local craft store, the jewelry and bead aisles are full of all sorts of interesting things! 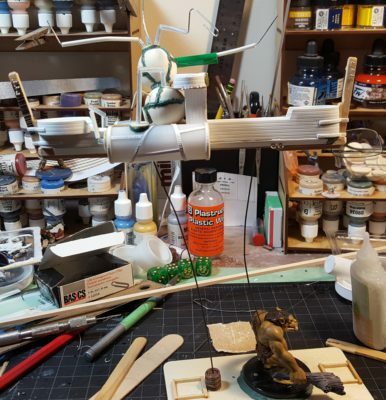 The greenstuff work on the gondola means it’s finally ready for priming and painting. I didn’t get a photo but the fabric patchwork is also finished on the balloon, so painting will start on that this weekend. I also need to get stuck into the (mostly minor) conversions to the half dozen Reaper Bones goblins who will serve as crew! The Feb 18th deadline looms like an irritated troll with a big club! Progress, the purpose of the troll revealed, and IT FLIES. I got most of the structural parts of the base done today, barring more greenstuff putty to solidify everything. 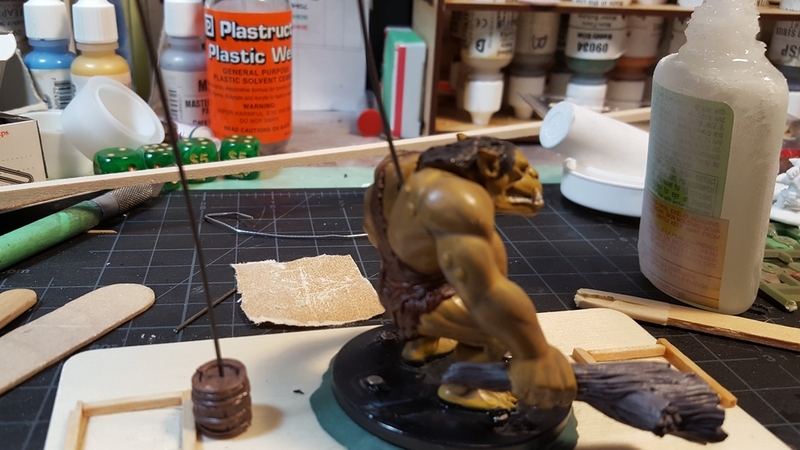 The big troll – an old prepainted WotC figure that I’ll be repainting – has a hole drilled between his shoulder blades and one end of a length of heavy steel wire inserted. The wire goes up to a detachable section of keel on the underside of the Blomp gondola, then comes back down and ends in the small barrel behind the troll. There’s four rare earth magnets in the troll’s base, one in the bottom of the barrel, and two more in the keel piece at the top of the wire. Everything seems solid enough to hold the thing up, although I did have to shorten the wires from their original height because everything was flopping around like a lying orange liar’s toupee in the wind. The Blomp’s base, with ground crew troll. I’ll use greenstuff to add a heavy leather harness around him. Click for larger. Here’s how the whole thing looks at present! Since this photo I’ve added more to the keel assembly at the top of the wires, which strengthens and stabilizes everything a bit more. The entire assembly at present. It flies! Click for larger. I’ve also added wires disguised as piping on the gondola, coming out of the central Improved Non-Explosive Flautulator Engine. 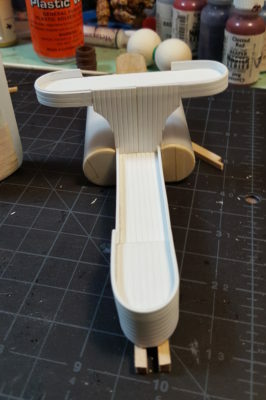 The piping into the lower part is largely decorative, but the upper piping will be the structural supports connecting the gondola to the balloon envelope overhead. The plumbing going in around the Improved Non-Explosive Flautulator Engine. See text for details; click for larger! I’ve also gotten almost all of the fabric glued on to the Blomp’s envelope, but didn’t get a photo of that. 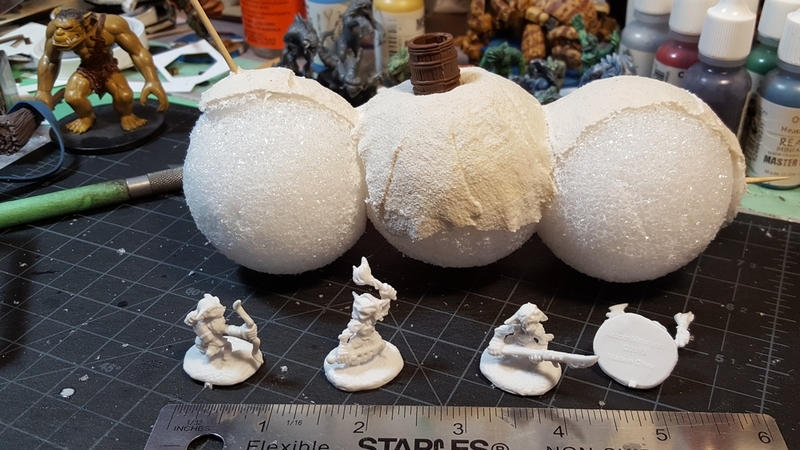 The next round is going to be more greenstuff putty action on the plumbing, base, and troll. I also need to get started on converting Reaper Bones goblins for camera operators, flight crew, and famous Blood Bowl announcer & personality Gobb Cherry, host of BB Nite in Gobada! I’m looking forward to puttying and painting a suitably loud suit and tie onto Gobb! Progress! Greenstuff! An incompletely explained troll! I broke out the greenstuff and went at the gondola this evening. I filled in under all the various discs where piping will come out, and then ran lines of greenstuff across the two spheres of the engine to make it look like it had been roughly welded or soldered together, probably by terrifyingly incompetent trolls under the direction of intoxicated, insane goblin engineers! 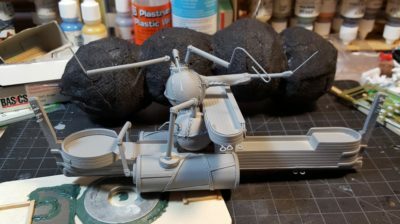 Greenstuff on the engine, pipe connections, and the start of the base. Click for larger. I also started on the base, with a rectangle of craft plywood, a big thick washer, and extra greenstuff. Base, troll, and such. Click for larger. The big troll on the right is going to be part of the base, forming part of the “flying” part of the flying base. Magnets will be involved. More in due course! Finally, I got another round of fabric bits onto the envelope. Hopefully one more round of gluing fabric bits down will finish off that part of the envelope, then it’ll be time for some detailing and paint! Envelope, with fabric patchwork in progress. Click for larger. Painting might start as soon as this weekend, although I have an Infinity event all day Saturday and I’m not sure how much time I’ll have after that for even more gaming stuff! The deadline for this Build Something contest is February 18th, which is closer than it appears, so I need to keep the momentum up! Good progress on the Blomp gondola this weekend, with all the major structural assembly finished, skinning done in styrene sheet, and the start of the lifting-gas engine and associated pipework. The bow and stern have “masts” (not sure what else to call them, really…) that will eventually have lines connecting to the envelope overhead, with metal strapping reinforcing them both. The flying bridge has more detail now, too. Just a couple of quick photos! Der Blomp, front-quarter view. Rivet lines on the hull tanks, rear camera station finished, and bow- and stern-supports in place. Click for larger. Der Blomp, stern-quarter view showing the start of the Improved Non-Explosive Flautulator Engine midships and the circular rear camera station. Click for larger. Holding the partially-complete envelope over the gondola to give some idea of the size and proportions of the finished article. Click for larger. 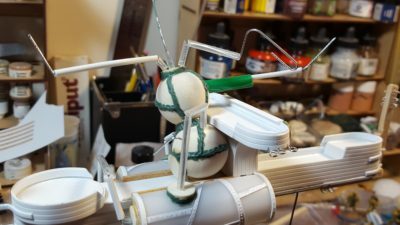 On to greenstuff next to clean up some parts and strengthen others, especially around the Improved Non-Explosive Flautulator Engine, which will connect all the wire pipework that will actually connect the envelope balloons to the gondola! Blomping onward, in a classic goblin-engineering “make sh*t up as you go” fashion! The front half of the gondola has been skinned with styrene sheet, cut in one continuous strip for strength. I also glued in more styrene strip on the inner edges of the gunwale. The edges of the flying bridge received similar treatment; both areas will be getting more detailing/decoration to finish them off. Styrene skin on the front of the gondola and the flying bridge. Click for larger. 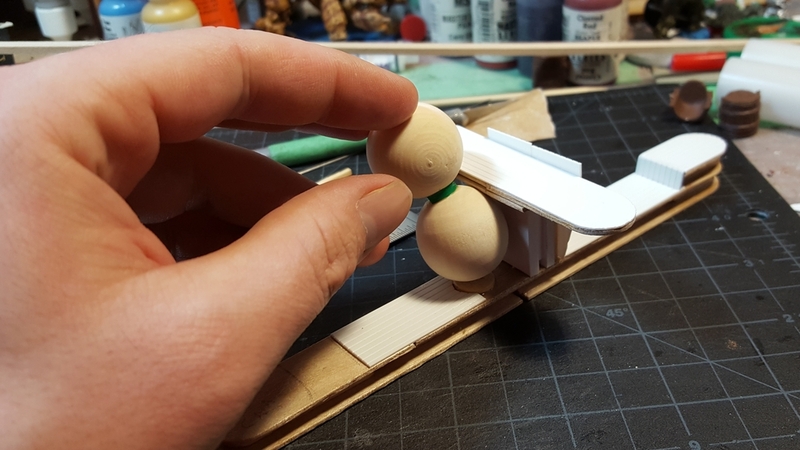 On the underside of the gondola I superglued a pair of 40mm X 20mm galvanized steel bases, and some scrap styrene to keep everything level. The keel went on next, long strips of 1/8th x 1/4th inch basswood. 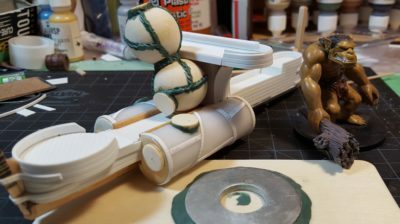 The metal bases and the slot in the keel will hold another piece of the same basswood with two or three rare earth magnets embedded in it to hold it into place, and a long steel wire (possibly two) leading down to the ground as the “flying” part of the Blomp’s flying base. Keel installation, with steel bases. The piece of basswood behind the superglue bottle is already notched for rare earth magnets. Click for larger. Finally I cut sections out of two plastic tubes (till receipt paper rolls salvaged from the recycling bin at a previous job!) 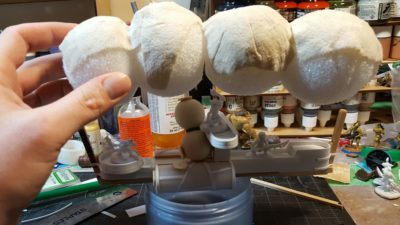 and glued them just behind the flying bridge as part of the lift/propulsion machinery – tanks of whatever mysterious, hazardous lifting gas the goblin alchemists have invented, probably! The end caps are wood craft circles trimmed slightly to fit, and the tanks will get detailed with rivets, weld lines, pipes, and such in due course. Midships tanks added. Click for larger. More soon as we progress! The February 18th end date looms like a looming thing! 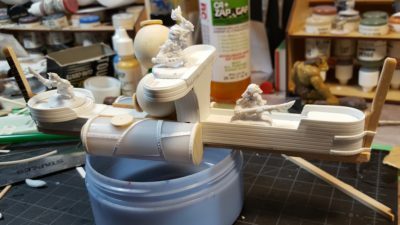 Progress on my Lead Adventure Forum Build Something 2017 entry, the goblin-crewed Bloodyear Blomp! 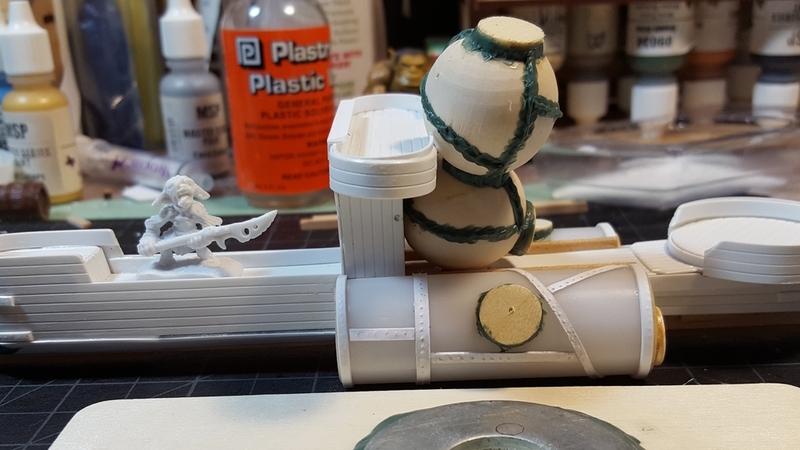 I’d said previously I was going to finish covering the blimp envelope in fabric before moving on to the gondola, but in standard wargamer fashion I’ve been distracted into working on the gondola first. The basic skeleton of the gondola is a couple of big hardwood craft sticks, cut and butted together with more scrap wood between them. The flying bridge is more craft sticks cut and jointed together, and the support structure under it is random scrap foamed PVC board. 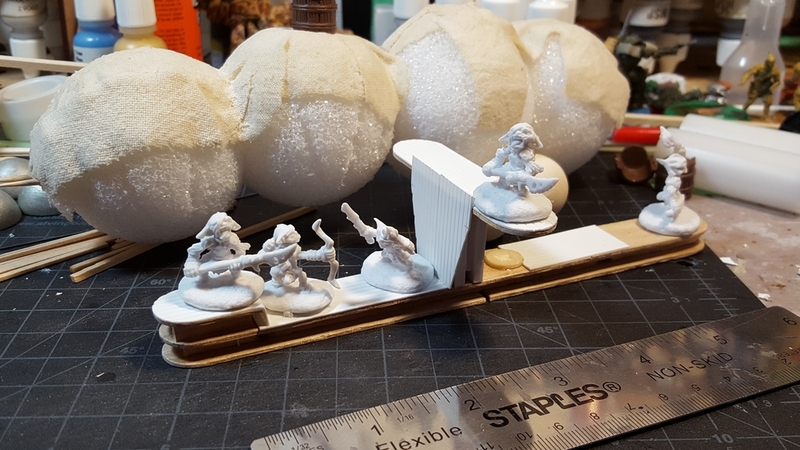 Blomp hull basic assembly, with Reaper Bones goblin crew for scale. Click for larger. The crew are going to be converted from Reaper Bones goblins; I’ve got a whole bunch leftover from my BB Goblin team conversion project and they’ll fit right in! First part of the Improved Non-Exploding Flautulating Engine. Finest goblin engineering! Click for larger. The midships portion of the gondola, behind the flying bridge, is going to be filled with the lift and propulsion machinery. 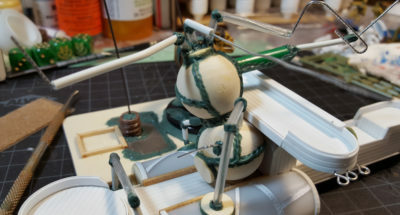 Pipes will lead from here up into the balloons of the envelope, with solid wire cores to provide the structural connection between the gondola and the envelope. 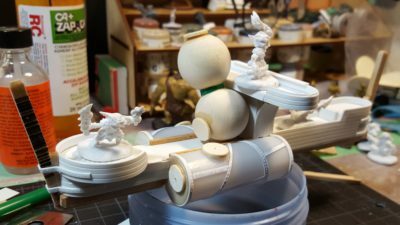 Every year or so over on Lead Adventure Forum they hold a friendly Build Something competition. There’s a theme that imposes some restrictions; one year it was “your scenery must be based on a CD”; we had “marine/watercraft” once, and this year the theme is “flight”. I’ve been a LAF member for years and it’s an awesome forum, but I’ve been fairly inactive over there for the last year or so. Joining the Build Something 2017 Contest was a good way to nudge me back into being an active member of this awesome online community. The theme being “flight” I thought of doing a cargo shuttle of some sort for Infinity, but with only a six week timespan to complete the entire contest entry in, from start to finish, I shelved that tempting idea in favour of an entertainingly silly piece of Blood Bowl sideline terrain: the goblin-crewed Bloodyear Blomp, which carries magical cameras and announcers over Blood Bowl fields all over the known world! To give it some actual in-game purpose, I’ll put a pair of Reroll counters on the base of the thing, to go along with the goblin scoreboard I made a while back. Being goblin-engineered (to push the term “engineered” very near it’s breaking point!) the Blomp can be a bit ramshackle, so I just started building! 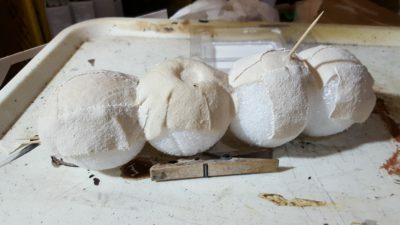 I picked up a pack of craft foam spheres as the balloon/envelope structure of the Blomp and started jamming them together and then covering them with bits of scrap fabric. Here’s the first building session’s progress. Blomp! First construction of the blimp envelope, and a few of the goblins who will eventually crew the thing! Click for larger. 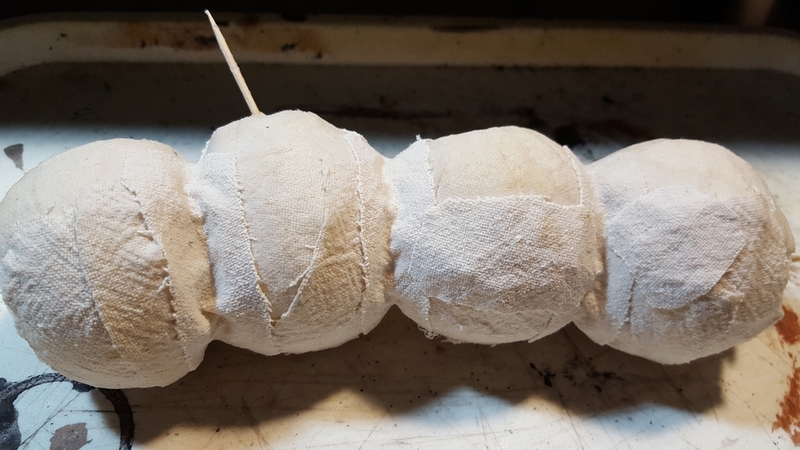 Since then I’ve added a fourth sphere to the tail end and done some more fabric. More Blomp! Fourth envelope sphere in place and more fabric. Click for larger. I’ve got a build thread over on LAF that will generally be updated faster and more frequently than I’ll do blog posts on the Blomp, in keeping with the spirit of the contest. I still need to figure out the gondola design and a bunch of other details, but it’s been a fun build so far! 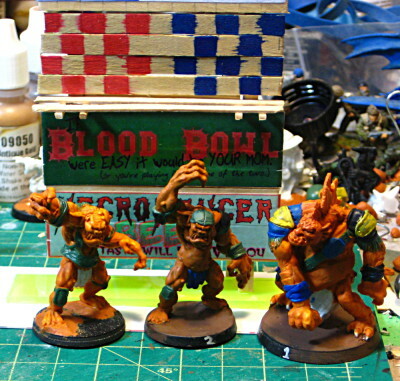 Decided that my Blood Bowl Goblin team, currently glorying in the name of T.U.R.D. (what that stands for changes every single game they play…) needed a scoreboard, to use as substitute to my existing Lizardman temple BB setup. Goblins have an reputation for being clever but not smart, and for lunatic behaviour at the best of times. This presumably explains why they attempt to play Blood Bowl at all, and excuses all sorts of things like really shoddy carpentry. With that in mind, I broke out the craft wood and set to work! Goblin BB scoreboard in progress. Three billboards for colour, and the actual scoreboard part two-thirds of the way up. Weather indicator will go between the two score placards. Click for larger. The main structure is coffee stir sticks, with basswood strips for the big vertical beams. The eventual plan is to have small rare earth magnets behind the scoreboard, embedded in a wood beam, to hold magnetic strip score number placards in place, and to have a smaller weather placard in between the two scores. There’s still some details to add, like “US” and “THEM” labels above the two score areas, and possibly a small announcers stand right at the top of the whole thing, some sort of rickety crowsnest with a raving goblin announcer howling away. The base has a strip of scrap acrylic with two holes drilled in it to support two bits of wire that go up into holes in the bottoms of the legs, holding everything solidly, and then some scrap plastic to expand the footprint a bit more. I’ll putty along the edge of the acrylic to blend everything together and strengthen things further. Three trolls and the scoreboard. You can see the rickety walkway in front of the actual scoreboard part here. The second image has all three of my trolls, all still very much works in progress. Left and centre troll are the same figure, with some fairly extensive arm surgery on the left hand troll to give him a different pose than the stock centre troll. All three are Reaper Bones plastic figures, which are awesome for Blood Bowl conversions! You can see the narrow walkway in front of the score panels nicely in this shot, which might get a gobbo scorekeeper perched on it eventually. More soon; I’m currently out of rare earth magnets and need to restock before I can finish this project the way I’m planning it. That should take place this weekend and then it’ll be fairly simple to finish the rest of the thing! Something quick and silly to break the month-long dry spell in posting! 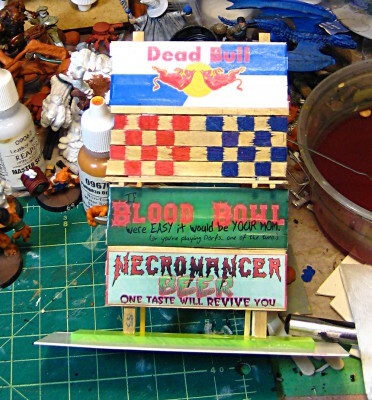 On our local Blood Bowl league’s Facebook page one of the guys made a joke about “Necromancer Beer – one taste will revive you” and while I was waiting for dinner to finish I fired Inkscape up and cranked out the following bit of fluff. Necromancer Beer – one taste will revive you! Feel free to print this for personal use! This is the same height as a number of other BB sideline ads already floating around the internet, so should mix nicely with them. Enjoy, and if you do use this, please send me photos of your pitchside scenery with the Necromancer Beer banner on it!